Welcome to my site! 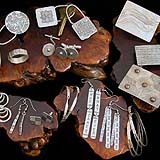 I create unique one-of-a-kind silver jewelry, much of which demonstrates my attraction to asymmetrical concepts- what I call “the art of asymmetry." 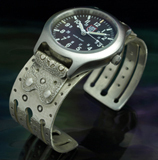 I specialize in silver cuff bracelets and watchbands for both men and women. But I make lots of other things too, including rings, earrings, belt buckles and key rings. I’m especially proud of my success with men who had never liked jewelry before, and with women who rave about my unusual hoop earrings. Over the years I’ve made hundreds of steel hand stamps, which I use to achieve my distinctive patterns and textures. Everything is fabricated by me- cutting, filing, bending, stamping, drilling, soldering, riveting, and lots of hammering! My work is often abstract and sculptural, and I frequently add elements of copper or gold. I love to create contrast! 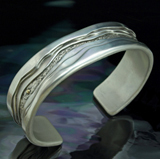 I want my work to be versatile, every-day wearable, and interesting to live with.